Otago University Press is producing beautifully designed poetry books with striking covers and internal designs that are both fresh and inviting. Diane Brown’s new book is no exception. The nifty look could be out of the fifties or sixties with its limited palette, the oval shapes and the time-pinning, parental photograph. Gorgeous. Being a child of the sixties, there is a nostalgic hue that draws me in. Plus the book is that rare poetry species – hard cover with a yellow ribbon. The book is about to be reprinted. or of love to husband and children. 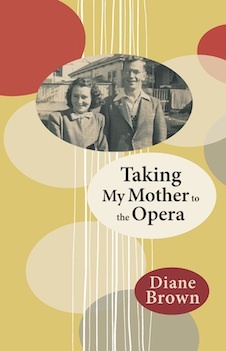 Diane’s memoir, then, transcends the photograph album and exposes miniature wounds (the mother not at the school gate, the fact you cannot eat poems), mysteries (mother) and allegiances (with father). The poet has lifted veils and allowed space for rankles, reflections, sympathies. As detail and miniature stories accumulate, the memoir sharpens. It is as though we intrude on a personal endeavor to get to the truth of the past (for each participant). Lots of billowy white space to explore. Admissions. It is hard not to bring your own luggage to the scene. To enter so deeply into behind-the-curtains stories of family life is brave. That the family portrait depends on economy rather than over-statement heightens the emotional kick. You get the arc of the poet’s life where it intersects the parents, but there is so much that flickers in fleeting traces. Absence heightens the focus. As writer, daughter and mother, the book raised many issues for me, issues that I explored in great detail in my doctoral thesis, issues that I want to return to in my new book. For now, Diane’s new book is a beautiful read — a rollercoasting, thought provoking, detail clinging, self catapulting, beautiful read. we never went to the opera, but the flowers sound right. I’ve always bought your mother flowers, why wouldn’t I? Actions not words, behind his back. his memory might be fading. the green tulle with a flared skirt; behind her ears, a dab of Evening in Paris, from the deep blue bottle. the parent tale we all want to read at bedtime—love uncomplicated and just for you. This entry was posted in NZ author, NZ poetry, NZ poetry book on December 7, 2015 by Paula Green.